Stavāmṛta Kaṇā Vyākhyā by Radha Kund Mahant, Pandit Ananta Das Babaji Maharaj:: How many self manifested, transcendental realizations of the glories of Radha Kund are coming to Shri Raghunath, who is the greatest object of mercy of Radha Kund, the lake of which he has taken shelter! In the previous verse Shri Raghunath explained how even Shri Krishna, who is the universal object of worship, must worship Radha Kund in order to attain the mercy of māninī Radha and get his desires fulfilled. One may now ask: “Did Shri Krishna worship Radha Kund to have his own desires fulfilled or simply because the place is so dear to him? After all, there is no glory in motivated service (sakāma sevā), because when the sevyā (object of service) does not fulfill the worshiper’s desires such a ‘devotee’ will give up his worship. Service becomes eternal and earnest when the sevyā is dear to the devotee and to answer such questions this verse has been written. 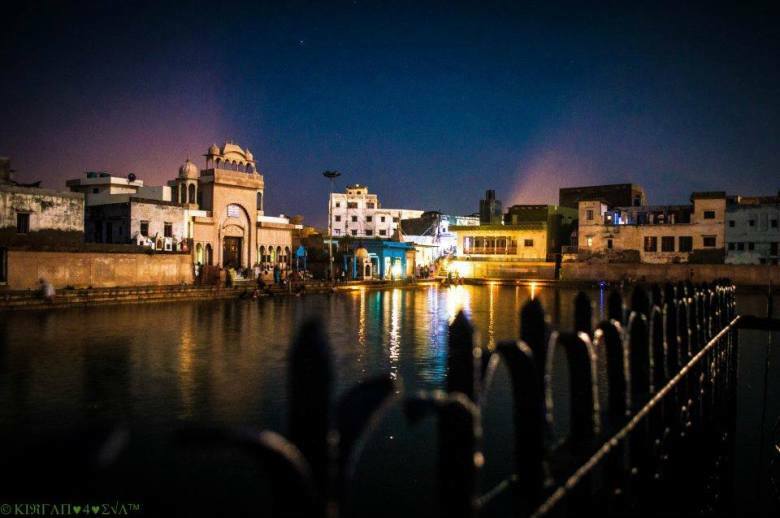 It has been said that Shri Radha Kund is as dear to Shri Krishna the moon of Vraja as is Shri Radha, the crown jewel of adolescent girls of Vraja. This verse from the Padma Purāṇa proves that it is simply out of love that Krishna worships Radha Kund as described in the previous verse and not just for the fulfillment of his own desires. Shri Krishna is the emperor of the fullest rasa and Shri Radha is the empress of the fullest bhāva. When we study rasa and bhāva we find that bhāva is the worshiper and rasa is the worshiped. Within this worshiped/worshiper relationship, Shri Radha is the crown jewel of all Vraja’s mahā-bhāvavatī-madhura-kiśorīs, because she can fulfill all of Krishna’s desires. From this statement we can understand what is the distinction between the worship of Radha and the worship of all the other mahā-bhāvavatī gopa-sundarīs. The verbal root rādh means ‘to worship’ and she who worships is therefore named Radha, the greatest of all the milkmaids of Vraja to worship Krishna. No other gopī in Vraja has such a significant name. For instance, anything which contains water can be called jaladhi, but pools, ponds and rivers are never called jaladhi by anyone. When one says jaladhi, everyone will understand that one means the ocean. That is so because the ocean is the root reservoir of all the water in the world. In the same way all the gopīs and indeed all the loving devotees may worship Krishna according to their own love for him, but no one else but Vrishabhanu Nandini can be called Radha. Vrishabhanu Nandini is the root reservoir of all Krishna-worship. Shri Radha Kund pleases all of Krishna’s five transcendental senses just as Shri Radha herself does: Krishna’s eyes enjoy seeing it, his nose enjoys the smell of its water and the lotus flowers floating in it, his skin enjoys the touch of this cool water, his ears enjoy the sounds of its chirping birds and humming bumblebees and his tongue enjoys the taste of its ambrosial water. Although Krishna is called vraja-bhuvana-sudhāṁśu, the moon who pleases the whole circle of Vraja, in this verse it is declared that Radha Kund pleases even his senses! paricitam api nāmnā yac ca tenaiva tasyāḥ. When Radha Kund advented itself Krishna personally gave it that name, as Shrila Vishwanath Chakravarti has stated: proce hariḥ priyatame tava kuṇḍam etat. When he first hears the name of Radha the ears and mind of Shyam, the embodiment of bliss, are soothed, his heart becomes agitated, his ears are showered by a stream of nectar, and the name has given to the bearer of that name a clear shape within his mind. When he hears this name he becomes very eager to meet the named one too; the name of Radha is filled with sweet honey. “What is this name Radha you have uttered just now? After I heard it Cupid awakened! Sakhi! Tell me, who has such a name? My mind can’t think of anyone else anymore! Describe her unrivalled form to me; I understand that it must be pure nectar! My eyes yearn to see her!” Thus spoke Radha Mohana Das. When Shyam hears even a single syllable of Radha’s holy name he eagerly wants to run up to the person who pronounced it, and when he hears the second syllable he immediately runs anxiously up to that person. When Madhava hears the syllable rā he becomes very happy, and when he hears the syllable dhā coming after it, he eagerly runs [after the person chanting it]. That is why Shri Krishna gave the name Radha Kund to the lake of his priyājī Radha, because her name is as dear to him as she is. Radharani is the crown jewel of all the sweet adolescent girls of Vraja and her kuṇḍa is as dear to Vrajendra-nandana, the moon of Vṛndāvana as she is. You become acquainted to the kuṇḍa through the name Radha and nothing is as dear to Krishna as Radha Kund, just as Radha herself is. May that most enchanting Radha Kund be the shelter of my mind!